Armrest Mouser reduces the fatigue caused by constantly extending your arm to mouse. 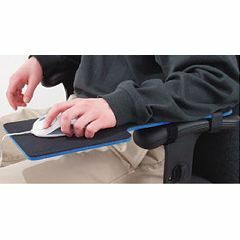 Padded mousing surface attaches to chair arm so your body is supported as you mouse. Shoulders are relaxed, and upper arm rests at your side. Two cinch straps attach the Armrest Mouseer to the arm of any chair. Slotted front for cord control. 18" overall length with an 8" x 9" mousing surface. Three cinch strap slots measuring 2 ¾" apart.